In a recent survey of my readers, I found that 72 % were gluten-free! Yay- this made me so happy, as gluten is a huge trigger for Hashimoto’s, and getting off gluten improved symptoms in 88% of those who implemented a gluten-free diet! In some cases, gluten free can single-handedly reverse Hashimoto’s (symptoms, antibodies, and need for thyroid medications can go away)… if that’s your root, cause. But there are other root causes besides gluten. For most people, it’s not as simple as getting off gluten. This article is going to focus on the second most common food trigger – dairy. Only about 40% of you reported being dairy free, yet 57% reported that they suspected being dairy sensitive. The most common ways people feel their reactions to dairy include gut reactions (like bloating, diarrhea and acid reflux), as well as lung reactions (coughing, asthma, sinusitis, postnasal drip, mucus) and skin (eczema, rashes, acne). The thing about dairy reactions, like all delayed food reactions, is that it’s almost impossible to know if dairy is a trigger for you, unless you go off dairy for at least 2-3 weeks, then reattempt eating it. If you’re thinking about going dairy free, read this article for information on the why’s and how’s of dairy free living. 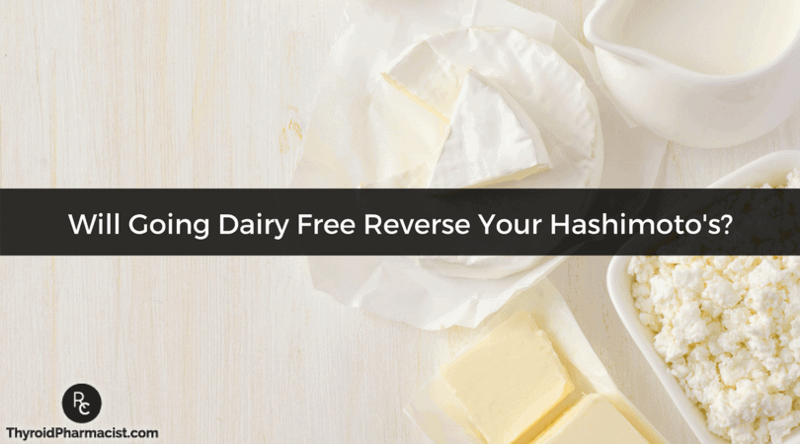 If you’re already dairy free, I hope this post will give you some new ideas for delicious dairy alternatives. Are You a Baby Cow? When the argument is presented this way, it’s tough to argue, unless of course, you can think of examples of people who are perfectly healthy and drink lots of cow’s milk. Thus the need for a deeper explanation. Cow’s milk contains proteins that are different than the proteins found in human milk. A person with intestinal permeability (which is always a precursor to autoimmune disease) is likely to recognize these proteins as a foreign invader and make antibodies to the proteins. These antibodies are mediated by the IgG branch of the immune system (different branch than the one that makes food allergies)- this is known as a Type IV Delayed Hypersensitivity reaction. Guess what other kinds of antibodies are IgG mediated? Thyroid antibodies, more specifically, TPO and TG antibodies. Hashimoto’s is also considered Type IV Delayed Hypersensitivity. I haven’t found research to back this up, but experience shows that eating foods that stimulate the release of the IgG antibodies and promote a Type IV Delayed Hypersensitivity response, will also increase thyroid antibodies. Perhaps it’s a “turning on the faucet effect,” or perhaps dairy proteins cross-react with the thyroid gland. More research is needed to quantify the exact reaction, but I can say that people who are dairy sensitive and have Hashimoto’s will have a reduction in thyroid symptoms and antibodies going dairy free. Time and time again! For me, getting off dairy meant no more irritable bowel syndrome, bloating, reflux and carpal tunnel. For Crystal, getting off dairy meant getting into remission [Read Crystal’s Hashimoto’s Success Story]. Limited studies are available on dairy proteins and Hashimoto’s. The only dairy related studies I’m aware of was one when lactose sensitive individuals with Hashimoto’s were shown to absorb medication better after lactose restriction (hey, it’s a start, right?). But just because there aren’t studies yet, doesn’t mean you shouldn’t try this intervention that can be life changing. Some believe that the pasteurization process can potentially denature dairy proteins, making them seem even more foreign to the body, and increasing the likelihood of an immune response. This is why some raw milk advocates will state that only pasteurized milk is a problem and that everyone should drink raw milk. This could be true, potentially, if you spent your entire life drinking only raw milk, however, most of us have not. Unfortunately, if you have already been sensitized to the pasteurized cow’s milk proteins, you’re likely going to react to the raw milk dairy proteins. They are similar enough. More bad news… goat’s milk and sheep’s milk proteins are also very similar to cow’s milk proteins and have about a 60-75% cross-reactivity, meaning that 60-75% of people sensitive to cow casein will also react to goat/sheep casein. Once a person becomes sensitized to the casein protein, they will react to all dairy across the board, possibly with the exception of camel milk. The camel is not a ruminant, but a Tylopode, and has different proteins in its milk. One study found that in those with cow milk allergy, only 18% also had camel milk cross-reactivity. Camel milk does not contain beta-lactoalbumin and has a different structure of casein—the two most reactive parts in cow’s milk. 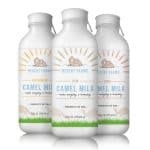 Camel milk has little fat (lactose content is only 4.8% making it easily tolerated even with lactose intolerance). Desert Farms sells camel milk if you’re interested in trying it. A physician in Israel reported healing cow’s milk sensitivities with camel milk in a subset of children. I reduced my reaction to dairy from an 8+ to a 1 over the course of four years… I did drink camel milk for about two weeks, which may have helped, but I also made a lot of other interventions that are known to reduce food sensitivities: strict dairy restriction, eradicating gut infections, gut healing protocols, and systemic enzymes. For me, dairy was a bigger reactive food than gluten. Eating even tiny amounts of dairy resulted in coughing, bloating, acid reflux, joint pains, and diarrhea. I’ve been dairy free for over four years, and my food reactions have dramatically lessened, however, a small amount of dairy will still trigger a cough for me (this past weekend I ate something that was marked “dairy-free” even though it had butter, and couldn’t figure out why I kept needing to clear my throat!). If you’re someone who is craving dairy, you should know that it’s not just in your head. The dairy protein casein, when broken down, can bind our endorphin (feel good) receptors in the body. Preliminary research in animals shows that casomorphins (from casein) and gliadorphin (from gluten) may have behavioral effects. Some have said that dairy is as addictive as heroin (which is a strong stimulator of our endorphin receptors). I think this may be an exaggeration, and there is no research to back that up (and obviously I can’t speak from personal experience here about the heroin, ha-ha), but I did find that I had slight withdrawal symptoms when I went dairy and gluten free (gluten by-products can also interact with morphine receptors in our bodies). I felt a little spacey and dazed for a few days, but something else happened too, my bloating and acid reflux went away, while my joint pains began to diminish. (If you are already dairy free and still have acid reflux, check out the video I made about the Root Causes of Hashimoto’s and Acid Reflux). If you’re thinking about going dairy free, it can be quite overwhelming. It’s best to prepare yourself. Can I Ever Have Ice Cream and Pizza Again if I go Dairy Free? Giving up dairy can be very scary, as dairy is a common staple in the standard Western diet, and a base for many rich, nourishing foods. However, giving up dairy may just be the one change that makes a big difference in your health. Please note: all of the suggested brands are dairy, gluten and soy free. Some of them are Paleo friendly as well as autoimmune Paleo friendly, but others may have additives that are not considered Paleo/Autoimmune Paleo friendly. Milk – milk is a combination of fat, protein, and carbohydrates. Almond milk is a secondary, but some may react to nuts. Rice milk is an option but it’s often full of sugar and no fat. Soy milk does have fat, carb, and protein, but soy is the third most common reactive food, so don’t throw the baby with the bath water out by replacing one reactive food with another reactive one! Cheese – for cream cheese, you can soak 1 cup of cashews in water overnight, then blend them with ¼ cup of water and one tablespoon of lemon juice in a blender like the Vitamix. For shredded cheese, the Daiya brand makes a gluten, dairy and soy free “cheese” that can be used in place of cheddar, mozzarella, and Pepperjack cheese on pizzas, casseroles and the like. They also have a cheesecake (which I haven’t tried yet) made with a gluten free crust. Ice Cream – So Delicious Dairy Free makes a coconut milk based ice cream in a variety of flavors! If you are autoimmune paleo, you can also try Yonanas, which is an awesome machine that turns frozen bananas into ice cream. Butter – Coconut oil works very well as a butter substitute for most purposes. Duck Fat is also a tasty alternative! Yogurt – Daiya and So Delicious Dairy Free make tasty coconut based yogurts. Pizza – Dayia brand makes a tasty gluten, dairy, and soy-free pizza. Protein for shakes – I recommend pea protein or beef protein as a substitute for whey protein in shakes. Sour cream – You can make a puree of cashews and lemon juice or use a coconut milk with a high-fat content, as the coconut cream. Hope this information helps you on your journey!! Wentz, I. Results of survey of 2232 people with Hashimoto’s. Your Thyroid Pharmacist Website. https://thyroidphramacist.com/blog/top-10-takeaways-from-2232-people-with-hashimotos. Accessed June 26, 2015. Fasano A. Leaky gut and autoimmune disease. Clin Rev Allergy Immunol. 2012;42(1):71-78. Luiz, HV. IgG4-related Hashimoto’s thyroiditis – a new variant of a well-known disease. Arq Bras Endocrinol Metab. 2014;58(8):862-868. Ruchala M, et. al. The influence of lactose intolerance and other gastro-intestinal tract disorders on L-thyroxine absorption. Endokrynol Pol. 2012;63(4):318-23. Asik M, Gunes F, Binnetoglu E, Eroglu M, Bozkurt N, Sen H, Akbal E, Bakar C, Beyazit Y, Ukinc K.Decrease in TSH levels after lactose restriction in Hashimoto’s thyroiditis patients with lactose intolerance. Endocrine. 2014 Jun;46(2):279-84. Muñoz-Torres M1, Varsavsky M, Alonso G. Lactose intolerance revealed by severe resistance to treatment with levothyroxine. Thyroid. 2006 Nov;16(11):1171-3. I just implemented Kefir in our diet and have been GF & Dairy free prior. Im wondering if the fermentation helps any of the downside to the dairy problem for hashis? I have Hashimotos and I’m type LADA diabetic – which means I have factors of both type 1 and type 2, caused by my autoimmune issues. I am not over weight and I exercise daily. SO WHAT am I supposed to eat??? I use minimal insulin so have to balance my carbs to control my diabetes. So I can only eat VERY small amounts of bean, fruit I stay away from potatoes, rice, bread, grains, cereals and milk. So if I cut out dairy all together what am I supposed to eat? Alyssa- The gold standard, or the most accurate test for uncovering reactive foods and individual food sensitivities is actually the Elimination Diet. Mary- I look forward to hearing your progress on this page!! Most people will see a dramatic reduction in gut symptoms, brain symptoms, skin breakouts and pain by eliminating the foods they are sensitive to. Some will also see a significant reduction in thyroid antibodies! An additional subset of people, will actually be able to get their Hashimoto’s into complete remission just by getting off the foods they react to, normalizing their thyroid antibodies, and some even normalizing their thyroid function! Here are a couple of articles you may find helpful. A2/A2 milk is a relatively new found gene in some cows. Those that have had issues with milk in the past, do not with A2/A2. I would encourage you to study this and let us know what you find. Ruth- The gold standard or the most accurate test for uncovering reactive foods and individual food sensitivities is actually the Elimination Diet. It works better than trying a recommended dietary approach (i.e. gluten-free, Paleo, etc.) and even better than food sensitivity testing (which may be helpful in many cases but may not be affordable for many people). The elimination diet can work as a stand-alone or in symphony with food sensitivity testing. In contrast to other diets that simply exclude common problematic foods, an elimination diet is done to determine what particular food intolerances the individual may have. This allows us to tailor the diet to the person, not to the dietary philosophy! Going through an elimination diet will help you figure out your individual food triggers and your specific response to each trigger food. Wondering I have had the IgG blood test from Nutripath Pathology Australia for dairy/casein/lactose and according to it I am not sensitive to dairy. Is this conclusive or do you think I should still be giving up dairy for my Hashimotos? Georgie – please, understand that due to liability issues, I am unable to answer specific medical questions. Here are a few articles related to diet that hopefully help you get started. I am just wondering about ghee or clarified butter. Is that OK to eat, as the milk fats have been removed? Kelly – thank you for following this page. Here are a few articles related to diet that hopefully help you get started. What about for hyperthyroidism, do you have any research on that? Ombretta – thank you for following this page. I experienced a hyperthyroid storm and have Grave’s disease a year ago. I had temporary paralysis of the lower extremities,lost 100 lbs within a month,heart was failing,voice was a whisper,numbness in hands,muscles were like jello. I’m better than I was but I don’t feel whole. Yes,I have hair loss and heat sensitivity,anxiety,depression.I am grateful for the grace and mercy that’s been bestowed upon me. I just want to feel whole. I’m taking methimazole 25 mg and propanol extended release. My question: What kind of diet should I try to help in balancing of this condition? Are the groups established for thyroid patients? This condition seems to be common nowadays. Lillian – thank you for following this page. Graves and Hashimoto’s are both autoimmune conditions that affect the thyroid. They are thought to be closely related. Sometimes one turns into the other. The difference is the site of the antibody attack. In Hashimoto’s, the antibodies are found to thyroglobulin (in 80%) and thyroid peroxidase (TPO) enzyme (in 95% of people)-Hashimoto’s results in hypothyroidism and is usually treated with Synthroid and replacement hormone. We need to rebalance the immune system to prevent this (sometimes the autoimmunity can be reversed as well! The gut determines your immune system. With the exception of discussing proper thyroid medication dosing, the majority of my website and my book focuses on balancing the immune system. The info I present is based on my own research and journey for overcoming my autoimmune thyroid condition. I have Hashimoto’s, causing Hypothyroidism. I decided to follow the suggested Dairy Free, Gluten Free, Sugar Free, Caffeine Free diet to attempt to lower my TPO’s. I have followed this diet for a month now and just went to have my TPO levels retested. They barely changed. How long must one follow this ‘diet’ to see a lowering/elimination of the TPOs? Does it not work for everyone? Carey – Thank you for following this page. IgG subclass antibodies have a half-life of 21 days, and stick around on immune cells for about two to three months. They need constant “reminders” in the form of an antigen so that their production continues. If the antigen is removed, the antibodies will go away as well. The time period required for them to completely forget about the antigen and disappear is nine to twelve months. I’m 23 years old and at the beginning of the two week liver protocol. Dairy is the hardest thing yet to give up. I do have one question. My little brother is lactose intolerant and he always drinks zero lactose milk. Is that an option for me to? Is homemade coconut milk kefir allowed on the AIP protocol? I have Hashimoto. Thanks! Rosaria – thank you for following this page. Here is an article I wrote that you might find helpful. I”m currently on the adrenal recovery protocol and skipping dairy was indeed something to get used to. Fortunately I really like coconut in every possible way. ? However, I just found out the thyroid medications I take have some lactose in them. Switching medications is not something I’m that eager about. So my question to you is, what do you recommend? An – Many people with Hashimoto’s are sensitive to multiple ingredients like dairy, soy, corn, and eggs. Tirosint, WP Thyroid, and Nature-Throid have the fewest additives as far as thyroid medications go. You can also work with a compounding pharmacist to have a special thyroid medication made for you without any ingredients that are going to sabotage your health. Thyroid hormones are known to have a very narrow therapeutic index – they are “Goldilocks” medications in that have to be dosed just right to ensure effectiveness and prevent adverse drug events. Thyroid hormones are dosed in micrograms — that is just 1/1000th of a milligram! When the dose is a teensy bit too high, we may have symptoms of hyperthyroidism, and when the dose is a teensy bit too low, we have symptoms of hypothyroidism! Jacqueline – Thanks for following this page! I’ll add this to my list of future article possibilities. Hello. Thank you for your helpful book. When you mention coconut milk, do you mean the beverage available in supermarket dairy cases or the canned coconut milk used for cooking? I saw an earlier comment asking about A2/A2 milk. You replied discussing the use of elimination diet, but did not address the question if there is any research suggesting A2/A2 milk may not cause reactive issues like A1 milk. Have you looked at this? From what I have learned many people who were dairy sensitive can consume A2/A2 products with no issues. Any comment? Do you consider eggs part of dairy for elimination purposes? I have already gone Gluten free for my Hashimoto’s and am going to try dairy free. My biggest issues is that I can’t eat coconut and I have a big intolerance to it. Stinks that most of the substitutes for dairy all include coconut. Dairy free. Can you have products by Lactaid? I know they just take the lactose out of products. Diana – thank you for reaching out. Dairy is a common reactive food in people with Hashimoto’s. Some people may have a primary dairy sensitivity, while others may develop a secondary dairy sensitivity due to the gluten-induced damage to the gut. You may have heard of lactose intolerance, a lack of enzymes that prevent a proper breakdown of the milk sugar lactose. This is just one type of dairy reaction, but it is not the same as dairy sensitivity, which, like gluten sensitivity, is mediated by the immune system. People with Hashimoto’s usually have sensitivities to the proteins found in dairy: casein and whey. All cow milk products including milk, cheese, yogurt, ice cream, and even butter should be avoided. “Healthy” protein powders containing whey protein also need to be eliminated. Some non-dairy cheeses may contain casein, the most problematic of the dairy proteins. Processed foods may contain dairy proteins and are best avoided. Finally, casein is a protein in dairy that is highly problematic for people with Hashimoto’s. If you are sensitive to casein in conventional cow’s milk, you will likely react to the casein in raw milk, goat milk, sheep milk, and lactose-free milk. If casein is the problem, why can’t you use whey? A good quality whey protein isolate would be free of both lactose and casein. Guy – thank you for reaching out. Dairy is a common reactive food in people with Hashimoto’s. Some people may have a primary dairy sensitivity, while others may develop a secondary dairy sensitivity due to the gluten-induced damage to the gut. You may have heard of lactose intolerance, a lack of enzymes that prevent a proper breakdown of the milk sugar lactose. This is just one type of dairy reaction, but it is not the same as dairy sensitivity, which, like gluten sensitivity, is mediated by the immune system. People with Hashimoto’s usually have sensitivities to the proteins found in dairy: casein and whey. All cow milk products including milk, cheese, yogurt, ice cream, and even butter should be avoided. “Healthy” protein powders containing whey protein also need to be eliminated. Some non-dairy cheeses may contain casein, the most problematic of the dairy proteins. Processed foods may contain dairy proteins and are best avoided. Finally, casein is a protein in dairy that is highly problematic for people with Hashimoto’s. If you are sensitive to casein in conventional cow’s milk, you will likely react to the casein in raw milk, goat milk, sheep milk, and lactose-free milk.